August 1st, 1966 was another moment in history that will always be remembered, yet will always try to be forgotten as well. On this day, the United States experienced their first mass campus shooting. Charles Whitman, a former marine studying at the University of Texas, stood atop the tower that graced UT’s campus and proceeded to shoot helpless victims. To this very day, the shooting haunts the campus of UT. The victims have long been dead, but the pictures and memories of the injured and dead are still very much alive. Many people who knew the victims or had been on campus at the time of the shooting tried to forget it happened and to move on with their lives. Others tried to memorialize it so that the dead would not be forgotten and so that a mass shooting would never happen again. Thirty years after the mass shooting at UT, professor Rosa Eberly wrote an article titled, “Everywhere You Go, It’s There.” This article discusses the ways in which memory is influenced by television, magazines, radio and other sources of media. She uses the UT shooting as an example of how people either choose to remember events or choose to move on and forget them. Eberly uses The University of Texas itself as a huge example to point out that the university tried to forget the horrific event, refusing even to talk about it. Depending on what people and the media do after an event can greatly impact the public’s memory. Choosing to remember or forget an event has a large impact on whether or not something will occur again, possibly worse than the first occurrence. Another horrific incident that greatly relates to how people remember an event is the Holocaust. Everyone remembers the Holocaust as one of the biggest mass murders ever to occur in Europe. 12 million people died, 6 million of them being Jews. The internet is still filled with tons of articles, proof, and pictures to show that the Holocaust was an actual occurrence and to lend vital information as to why and how it happened. The information and proof of this deadly event helps future generations remember what happened and to try and make sure it never happens again. 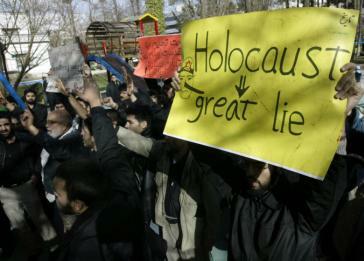 The problem is that some people refuse to believe that the Holocaust ever happened. They make up their own ideas and proof to try and explain what exactly happened in Europe so many years ago. If one would go onto the internet and type in “Holocaust Denial,” tons of links and images would pop up supporting the denial, possibly convincing others that it never happened. This is what Eberly tries to argue in her article. People choose to believe and handle events in certain ways and it can greatly impact the rest of the public’s opinion. Someone who does not know much about the Holocaust could watch one of the Holocaust denial videos and possibly believe it. It would be devastating for a Holocaust to occur again, and individuals denying that the Holocaust never occurred are almost making sure that one could possibly happen again. A video on YouTube titled “Auschwitz: Why The Gas Chambers Are A Myth,” is an example of a media source that tries to prove how the gas chambers used during the Holocaust were a myth. The video tries to prove this claim by using eye witness testimonies, blue prints, a 3-D model of an Auschwitz gas chamber, and satellite photos. The video can be convincing to someone who does not know a lot about the Holocaust, so their opinion can be easily swayed. Thus, the Holocaust would not seem like such a deadly occurrence to them. This problem can lead to it happening again if enough people begin to think the Holocaust was fake. People choose to remember or forget events for certain personal reasons, but major events like mass shootings and Holocausts must be remembered so that they never occur again. History tends to repeat itself when one forgets what has happened before in the past and does not try to prevent it from reoccurring. This has become very true in somewhat recent events with the Columbine Shooting and the shooting in Newton at Sandy Hook Elementary. On the internet, there are many pictures and videos that try to portray the Newton shooting as a hoax as well. Even though Eberly’s article was written years ago, it is still a vital example to everyone today how the media can sway people’s opinions and memory, especially since the media is still doing it today with recent events. I am a JMU student. I am an English major with a WRTC minor.